Less than two weeks into 2017 and it's already Friday the 13th! That's an auspicious start to the new year, if I do say so myself. But why avoid the superstitious spookiness? Embrace it! Make it a horror-filled day with some of our zombie games. The zombie fun doesn't end there! If you have a horde of friends, I Hate Zombies is for you. You can play up to 12 people (and we've played moderated games of up to 40 players! ), with this easy-to-learn, fast-paced party game. Think Rock-Paper-Scissors with hilarious special powers and the ability to turn your friends into zombies. 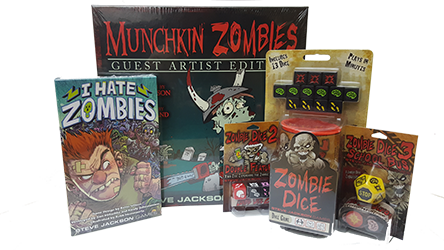 If you're a Munchkin fan, then Greg Hyland's new Munchkin Zombies Guest Artist Edition will give your favorite undead a fresh new look. Well, as fresh as rotting flesh can be. Check out this interview with Greg to get some insight on his art necromancy. Pick up any of these shambling games and expansions at your local game store today! And just remember; zombies aren't real. Right?